The fallen leaves remind, once again, that the Hunger Games of securing coveted tenure-track academic jobs have begun. This is my second year serving on the Northwestern University Department of Neurobiology Search Committee, and we’ve received nearly 300 applications for a single faculty position this time around. Less than a third are from women. We often hear about the leaky STEM pipeline, and the data bear this out, both at the national levels and within our local search. From what I see as a recent female postdoc with children and now an assistant professor making hiring decisions and advising postdocs seeking academic positions, there are some serious problems uniquely faced by women in academic STEM (science, technology, engineering, math) fields. Our applicants are impressively accomplished, and their age matches their scientific contributions. On average, this group – both men and women – defended their PhDs a little before 2008. That means that now at the close of 2015, the bulk of our applicants have lingered in postdoctoral limbo for more than half a decade. A postdoc position used to be an optional step toward independence in my field of neuroscience. Eventually, a year or two of research experience after receiving a doctoral degree and before winding up in a faculty job became expected. But now, seeing strong candidates with less than five years of high profile post-PhD work is rare. The lengthening of this training period is reflected in the aging pool of recipients of R01 grants, the key funding mechanism for biomedical science laboratories, administered by the National Institutes of Health. The average age of first-time recipients has crept up to 42, while the proportion of R01 holders younger than 36 has dropped from 16% in 1980 to 3% by 2010. The National Science Foundation reports that women have comprised half of STEM undergraduate degrees since the 1990s. Yet, a gender gap emerges during the long years of academic training, and it grows substantial in time for faculty appointments. 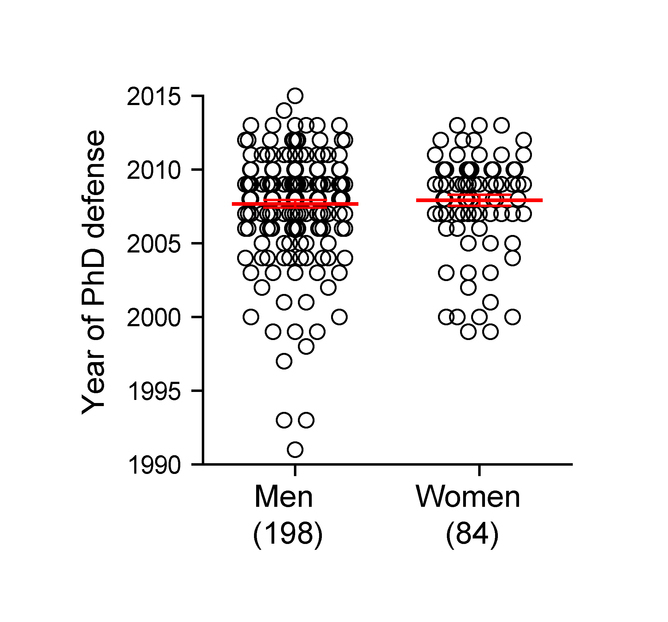 As seen in our representative pool of applicants, the average applicant age for tenure-track assistant professor positions is now past the peak age of female fertility (think a PhD at 28-29 years of age, plus a 5-7 year long postdoc). Here’s where things get sticky for those who think the advances of feminism mean women should be able to cobble together some version of “having it all.” Building a family while pursuing a STEM career has pitfalls. Delaying childbirth until reaching a tenure-track job could mean long years trying to conceive and expensive assisted reproductive technologies – average price of an IVF cycle is over US$10,000 – with no guarantee of success. So, a female scientist who wants a family must seriously consider childbirth during her postdoc. However, postdoctoral salaries are low, and the days are long. The recommended starting salary for a new research fellow is below $43,000, per National Institutes of Health. A year of high-quality childcare for two kids at daycare centers near prominent research institutions costs more than a postdoc salary – even before taxes are taken out. While high daycare costs in US cities (even surpassing $2,000 per child per month in some places) seems like a problem for male and female postdocs, it disproportionately affects aspiring female academics. As described in the Dual-Career Research Report from the Clayman Institute for Gender Research at Stanford University, academic females are more likely to be partnered with academic males. The same is not true for the more numerous males. Many successful academics acknowledge the importance of stay-at-home partners, or partners with flexible jobs, in their rise to academic fame. As described in the same Stanford report, 20% of male academics, but only 5% of females, have a stay-at-home partner. These gender differences, together with the fact that even in our egalitarian society, accomplished women in leadership positions still tend to be responsible for the majority of childcare, mean that the careers of women in STEM are hindered by the choice to have a family. Universities today are doing more for the families of their faculty and, increasingly, many are expanding benefits programs to cover all of their staff. 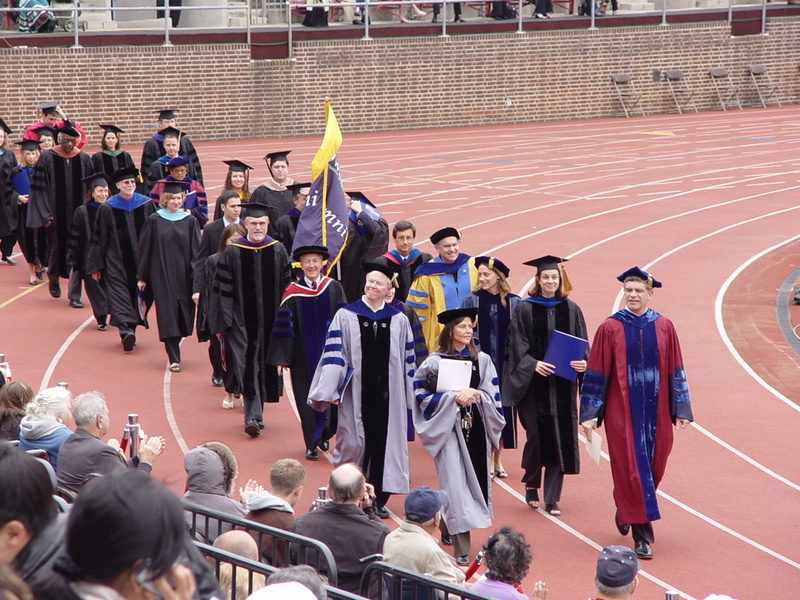 But postdoctoral fellows, often classified as trainees, can fall through the cracks, receiving different, lesser benefits than faculty and staff. Sometimes, they receive no benefits at all. Recently, the National Postdoctoral Association released a large Institutional Policy Survey that highlighted considerable variability in benefits and programs available to postdocs in responding institutions. Postdoctoral training features benefits that are remnants of an earlier time when postdocs were rare and transient positions. Award several thousand dollars to female postdocs with children when they go on the academic job market. This can cover high-quality childcare, travel with children or living costs for family caretakers. Create competitive internal scholarships to fund a research technician for a year, when a female postdoctoral fellow is pregnant, or with infant. The technician would carry on the fellow’s experiments during the time she must be away from the bench. Ensure that postdocs’ benefits don’t vary based on salary funding sources (that is, grants, fellowships, etc), and that their benefits are comparable to faculty and staff. Train and perhaps financially support the laboratory directors of female academics with families. University faculty are taught to recognize and avoid misconduct, but not how to help pregnant female trainees design flexible work schedules that advance their career while protecting family time. The cost of some of these programs would be pennies in the budget of our great research institutions, but the impact on gender distribution in STEM could be transformative. Moreover, such programs are likely to have immediate measurable impact on the success of women postdocs transitioning to independence in academia. The institutions that take the lead will attract the top STEM postdocs. For sure, designing programs to advance women in STEM will take careful consideration, when even a Supreme Court justice takes a stand against affirmative action, suggesting that minority students might fare better at less-advanced, slower-track schools. But let us not silence half our voices. Diverse companies and institutions are more efficient and more creative. Both pragmatic and social justice considerations support striving toward a STEM workforce that mirrors US demographics. We should ensure that the odds in academia, however low overall, aren’t stacked against female aspiring scientists who hope to have families. Visit the Elsevier Store to access books on women in STEM, professional career development and much more! Use discount code “STC215″ at checkout and save up to 30% on your very own copy!